This was SO GOOD! The meat was so tender! I find this kind of dish perfect for days when I work from home, as it takes only 20 minutes to prepare then I can get back to work while it is slowly stewing in the oven. I think this will be a perfect dish for a dinner party too as it allows you to multitask - while the dish is cooking away in the oven, you can clean the kitchen counter, prepare for the appetizer and side dishes, and set up the table for a cozy evening with friends/family. I served this with simply some boiled potatoes, so we could mash the potatoes on our plates to soak up all the finger licking sauce. 1. Mix the basil leaves into the chopped tomatoes, and set aside. 2. Heat the oil in a casserole over high heat until i is sizzling hot, then brown the beef in batches. They need to be a good, deep nutty brown color. Remove to a plate. 3. Turn the heat down to medium, stir in the onions and cook them for about 5 minutes until they carmelize at the edges. Then stir in the garlic and return the meat to the casserole. Sprinkle in the flour and papika powder, and give it a good stir. 4. Add the bay leaves, tomatoes, and season well with salt and pepper. Let it all come slowly up to simmering point, then cover the casserole and cook in the oven for 2 hours. 5. 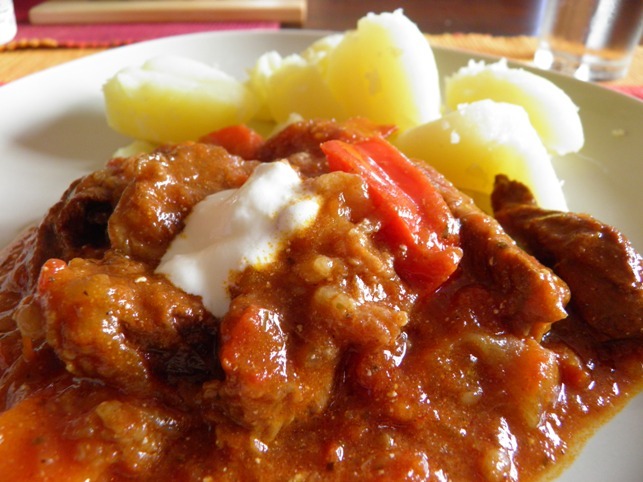 Then stir the peppers into the goulash, cover and cook for a further 30 minutes in the oven. 6. Just before serving, take the casserole out of the oven and let it stand for 5 minutes. Then stir in the sour cream to give a creamy effect.